Replace your high cost (it’s 8 to 10% of your utility bill) and Earth unfriendly clothes dryer with a zero emission clothesline and breathe in that fresh air scent. Thornbury’s Home Hardware will be giving you one at cost through the new Eco Action Centre. Georgian Triangle Earth Day Celebrations and Elephant Thoughts’ August team of paid teens will put up your clothesline for no extra fee, and if you live in the immediate area, Home Hardware will deliver the package to your home or pick it up in Thornbury once you have obtained our Eco Action Certificate to do so. The supply of clotheslines is limited so write to us soon at celebrateearth@yahoo.ca using the subject heading, “clotheslines”. If you are wondering if your bylaws permit clotheslines, a provincial statute has all municipalities grant home residents the right to put one up. Elephant Thoughts and Georgian Triangle Earth Day Celebration are still looking to fill three spaces out of ten in their August, Monday to Friday, Eco Action Centre program. Teens will receive $15 an hour for 20 hours of work each week; as well, there are 15 hours of leadership education related to biodiversity and climate that prepares them to be eco-community ambassadors. Each day will be different: bicycling over for hands-on work in the Collingwood Community Garden , river restoration work and fish monitoring with Nottawasaga Conservation Authority, helping to create and be part of a biodiversity action program to involve more adults through Free Spirit Tours, researching and publishing an article in the Collingwood Connection, reading selections from Thomas Homer-Dixon’s insightful books and discussing them with him at our Kolapore Wilderness Eco Centre, reading and being inspired by (and meeting) EcoJustice lawyer, Albert Koehl’s thought-provoking ideas on transportation alternatives to transform the climate destabilizing means of transport we have now, meeting close up with honey bees to learn how they interact among themselves and Nature, and act on drastically reducing our individual unethical 20 tonnes of greenhouse gas emissions to 3.5 tonnes (the average level of emissions if our fossil fuel activities were shared evenly between all 6.9 billion people) each year while encouraging peers and family to do the same. Importantly, this program moves beyond education by creating the actions that make it possible for constructive change to take place. This Centre and the new co-op biodiversity/climate high school program leave the 20th century consumer mentality behind and find solutions for a 21st century land ethic. Governments and some environmental groups speak in glowing terms about us becoming “green consumers”. They focus on the absurd strategy of buying our way out of human made climate destabilization and biodiversity loss crises through a hybrid car, ‘eco’ clothes or even a light bulb. There is always some new technology or ‘green’ product that will save us from having to change our nasty over-consuming way of living. Living simply is not an option because economic growth is the only deity that is accepted for the green corporatist. Pushing a lawn mower instead of using a gas or electric one and erasing 5% of Canada’s pollution might make us fit, breathe easier and conservation conscious, but it doesn’t hike up the Gross Domestic Product by buying 880 million gallons of gasoline to top up gas mowers across North America. Having a basin in the kitchen sink when we wash vegetables, run the tap to get a cool glass of water or wash out coffee grounds doesn’t involve buying anything but will save an astonishing quantity of water for later use in your garden and lower your water bill. Most importantly, young people will see that adults care as well as witnessing how much water their family saves on a daily basis. Getting Mom and Dad to cycle or walk to work or if need be, having them put their bicycles in the car and cycle part way to visit friends is a 21st century way to uncouple us from the 20th century Carbon Club. Youth under 20 years of age need to lead the way. What now remains compared with what then existed is like the skeleton of a sick man, all the fat and soft earth having wasted away, and only the bare framework of the land being left. From Plato’s Critias written around 360 B.C. In the 1950’s there was overwhelming evidence that various groups had not attained equitable rights under the law. During the 1960’s and onward Canadian and United States governments and institutions tried to remedy this discrimination by giving minorities or marginalized individuals greater access to a university education through quotas and fair wages. In America, J.F. Kennedy called this ‘affirmative action’, and in Canada the federal government and Supreme Court Judge Rosalie Abella spoke of ‘Employment Equity’. In 1985 our Charter of Rights and Freedoms spoke of ‘Equality Rights’ that demanded society include women and other groups into a broader and more creative civil covenant and insisted that Canada pull down barriers that encumbered citizens’ full potential. In certain cases it was acknowledged that disadvantaged groups need to be given extra help, if only temporarily, in order to ‘level the playing field’. There is no doubt that minority groups in the United States gained historic access to higher education as a result of affirmative action programs, and when these same programs were taken away, as was the case in California, admissions for black students dropped by 80 percent. The disabled and the marginalized, including many women and aboriginal peoples, are not the only ones to benefit from affirmative action but society as whole. It is vital to now apply that same vision to Nature; it is long overdue. Balance has not been achieved between economic interests, community/societal goals and Nature, although economists and corporations sometimes declare that to be their goal. For most of human history it was a given that Nature was to be conquered and literally consumed; in 2010, with that destructive legacy, ecosystems are beginning to collapse. 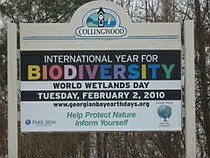 Species are being brought to extinction directly as a result of individual, corporate and government prejudice against permitting Nature to recover from past and present human excesses while contemptuously not caring about ecological boundaries that constitute a resilient future. . A recent example of this is Canada’s refusal to vote for protection of many endangered species such as polar bears, hammerhead sharks and bluefin tuna, to name just a few, at the Convention on International Trade in Endangered Species held in Qatar this March. Although affirmative action is still controversial for some, many countries have been able to give previously disadvantaged groups the means to contribute to their world, and thereby create a stronger and less violent society through programs and legislation in the last fifty years. Disadvantaged Nature can no longer be excluded from societal/planetary aspirations except at our extreme peril. If we have indeed subdued Nature it will be for a very short time. Nature, the fundamental building block for community and the economy, is in deep trouble and so are we. All citizens need to have the wisdom now to give back to the Earth its health and well being. To read the headline, ”Copenhagen Accord pledges are paltry” in the science journal, Nature, that goes on to say, “Canada is the only country that both weakened its ambitions in the course of the negotiations and effectively argued for an increase of 2020 emission allowances…” is to feel ashamed. Societies, with much smaller populations, have often been ‘skilled’ in not knowing limits to growth, and “these ravages” of ecosystems Plato mentions in his dialogue, had begun before his time. Today’s ecological bottleneck is bred from a history of interwoven ills that have consequences not only for one region like Plato’s but for the entire planet. It is time to not “turn away and lose the name of action” but now steadfastly insist that Nature must have a place at the table at home and abroad while being second to none and then, and only then, there will be true balance and a civilization worthy of the name. The United Nations Report Global Biodiversity Outlook 3 (GBO3) was released in May to coincide with the outcome of biodiversity targets governments pledged to meet in 2010. Goals that were established in 2002 by the world’s governments were not met. As Canada celebrates World Environment Day, whose theme this year is “Many Species, One Planet, One Future” on June 5, it has the dubious distinction shared with the United States of losing a higher percentage of forest cover than other countries in the world, including Brazil and Indonesia between 2000-2005, according to the National Academy of Sciences-USA. In other words, Canada lost 160,000 square kilometres of forest as a result of human (tar sands, climate change induced mountain pine beetle infestation, forest exploitation, to name just a few) and natural causes such as lighting causing fire . On a provincial level we know that biodiversity loss continues to diminish well-being in Ontario. For example, the annual report by the Environmental Commissioner of Ontario, entitled “Building Resilience” is critical of weak efforts to protect our amphibian population who give us a realistic picture of the overall level of health in our communities. Habitat loss or its degradation and fragmentation lead the causes of their destruction but unsustainable harvesting, invasive species, emerging diseases as well as climate change and ozone depletion is threatening our area’s amphibians more than ever before. Local municipalities don’t help by continuing to grant development corporations permits that destroy our wetlands and forests while mandarins proclaim a vision for the future in sustainability ‘plans’ that are a travesty of democratic involvement and scientific knowledge. Governments around the world have essentially refused to protect our youth and future generations of life on Earth. The 95 page GBO3 reflects this tragedy on almost every page through graphs, photographs and text. Affirmative action for Nature, as mentioned in a recent article, is as much a value and moral issue as it is a beginning of a survival plan. Such a plan can protect both disadvantaged humans and life on Earth. If governments have shirked their responsibilities to act in the best interests of their citizens, an involved ethical citizenry will create the means for change. The GBO3 points out that those areas that are considered sacred by indigenous communities are able to sustain the resiliency of natural places and support local economies. Achim Steiner, Executive Director, United Nations Environment Programme, is worried that nations and many adults have “fabricated the illusion that somehow we can get by without biodiversity or that it is somehow peripheral to our contemporary world”. GBO3 speaks of a crisis in genetic diversity. Natural areas, livestock and seeds for crops are undergoing vast species extinctions. Collingwood finally has a community garden where we’ll emphasis the growing of heritage seeds and low-impact organic gardening practices. Georgian Triangle Earth Day Celebrations, Elephant Thoughts and Katimavik are breaking ground next week, thanks to Margaret and Eric Willis’ donation of ¾ acre of sunny ground. It is a chance for our community to work together and begin to fashion a cohesive response to biodiversity loss through one of several positive hands-on initiatives that will inspire young and old. 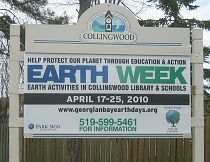 If you are interested in participating in the garden, write to celebrateearth@yahoo.ca More to come regarding this exciting venture.